Belfast, Northern Ireland: Suki Tea celebrate 5 years of supporting visual artists in Northern Ireland, with a series of conversations to hear more from some of Belfast’s brightest talents. 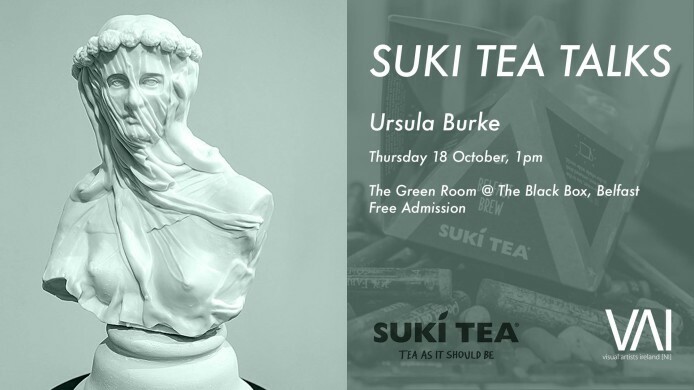 The Suki Tea Talks will begin at the Black Box on Hill Street, on Thursday 18th October with a lunchtime talk from 1pm by Ursula Burke. Ursula will be giving a visual tour of her work, followed by a informal chat with Oscar Wooley, co-founder of Suki Tea. Ursula was the 2018 winner of the Suki Tea Art Prize, and recipient of the two month artist residency at the Centre Culturel Irlandais in Paris, a prize worth over £3,000. Ursula Burke is an Irish artist who works within the discipline of sculpture. She uses a variety of media including porcelain sculpture, embroidery, drawing and photography. Much of her fine art practice deals with issues of representation and identity within contemporary Ireland, north and south of the border. She works with the personal and political in Irish society using multiple points of departure, from which to generalise her approach outwards to international concerns. Suki Tea began their partnership with Visual Artists Ireland in 2014, when they became the main sponsor of the city-wide initiative - Belfast Open Studios. In the first year 14 artist studios opened their doors to the public to allow visitors to get a glimpse into the usually private spaces where artists create their work. Suki Tea provided tea and tea-making facilities at all the venues to help create a warm welcome to the studios. Over the last four events, over 250 artists have welcomed over 3,000 people into their studios.